Have you imagined a guiltfree gulab jamun treat? With 2 packets of instant gulab jamun mix in my pantry and no plans to make gulab jamuns (deep fried dumplings), I started to browse recipes online and my search for such treat ended here. 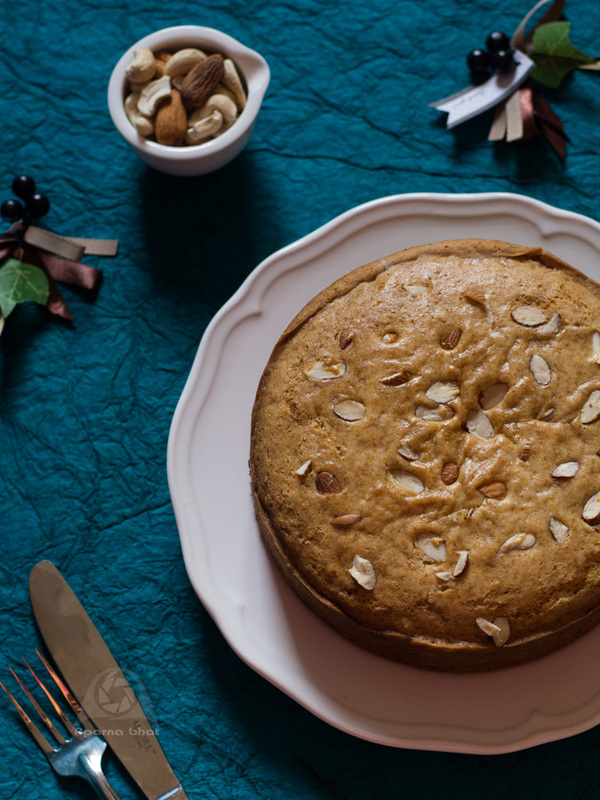 This cake is soft and delicious, and when I took a bite into this cake it was full of gulab jamun flavors. A super recipe that is prepared with easily available ingredients and no fancy equipment. So friends try original recipe or the below recipe (an adaptation of the original recipe ) and let me know your feedback. Preheat the oven at 180 deg C for 10 mins. Prepare a 6" cake tin by lining it with parchment paper or greasing it. Keep it aside. Powder sugar and measure 3/4 cup + 2 tbsp of it. 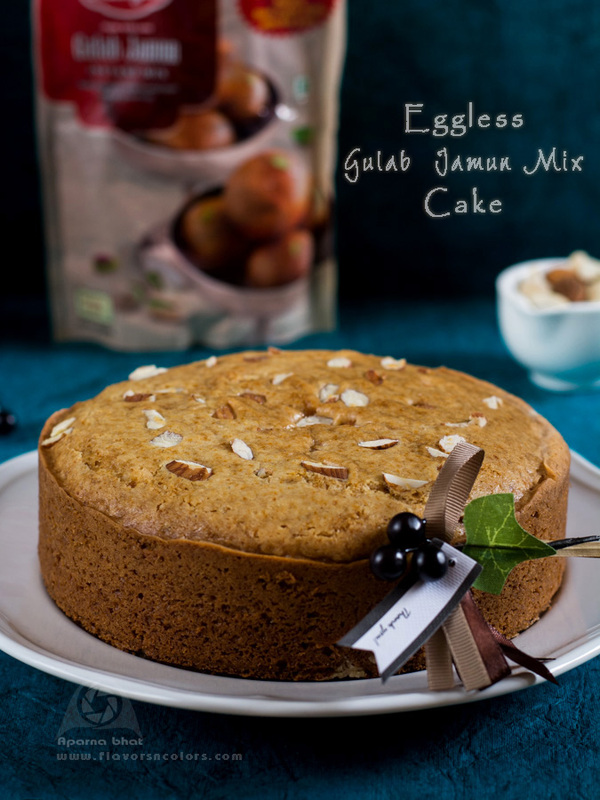 Take it in mixie vessel and to this add gulab jamun mix and run the mixie for one time. Sift all purpose flour, baking powder and soda together. Now add powdered sugar and gulab jamun mix to the flour. Add cardamom powder and mix it well. In another bowl whisk together cream, milk and oil. Add the wet mixture to the dry mixture and fold gently. See that there are no lumps. Mix nuts [sprinkle some flour over these nuts before adding them to batter]. Pour the batter in greased tin and sprinkle the remaining nuts on top. Bake in preheated oven at 180 deg C for 50 mins or until done. I have used the oven that comes with cooking range and every time I baked this cake it took me atleast 50 mins, so check your oven settings and adjust the baking time. Let the cake cool down for 5-10 mins in the cake pan itself. Later shift it to cooling rack. 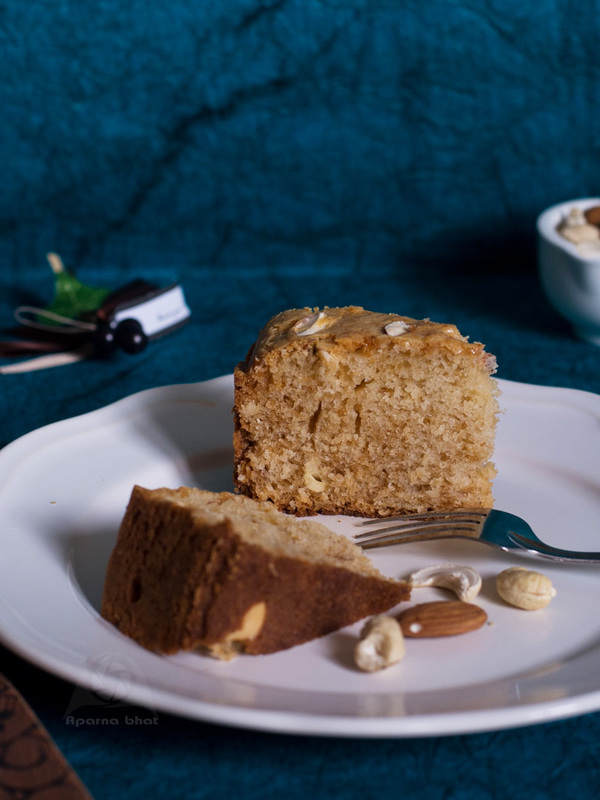 Slice and serve this delicious cake and let your family/friends enjoy it while guessing the flavors in the cake. The original recipe has mentioned about using IFB microwave oven in her comments section so if you have microwave oven, go ahead with the original recipe as mentioned here.